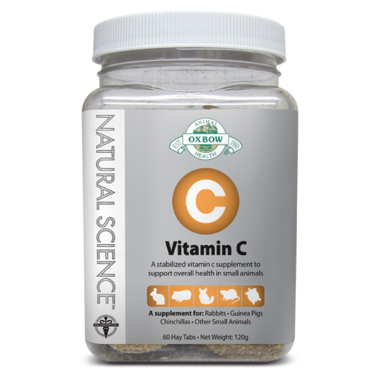 Oxbow Natural Science Vitamin C is a hay-based, high-fiber supplement containing the essential stabilized vitamin C that guinea pigs need, and other animals benefit from during times of stress, illness or recovery. My piggies love these and they are good for them too! One suggestion, I always break them up into pieces so that it is easier for them to eat. Vitamin C is essential for guinea pigs, this is a great way to ensure they are getting enough! Oxbow products are excellent.